Don’t stay with the spray. That’s the short version. Here’s a little more detailed explanation. We know that even a drop of water per second over 1000 years would make a big hole, so imagine what a water jet at 40,000 psi (2750 bars) would do to that same surface. Exactly, it would make a big mess. So, by taking that same water pressure and moving it over that same surface at rotation speeds up to 1000 mph, you can clean the surface/remove the striping without harming the surface. 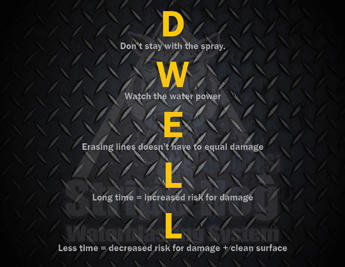 Because damage is caused by too much Dwell Time not the amount of water pressure. So basically, in order to properly perform stripe removal without damaging the surface you must find the right combination of water power (40,000 psi), speed of the power (1-1000 mph rotation) and speed of the truck. At Stripe Hog our standard is 98% removal and zero damage. That’s right, we have ZERO TOLERANCE for damage. To learn more about Dwell Time or the Stripe Hog removal systems, click below.